“History Snippets” serializes small bits of research from an unfinished test project. The theme is technology and natural events that shaped our modern world. This is about the world of Athens and Sparta in the time of the Battle of Marathon. Sparta did not participate in this battle, but later redeemed itself in the even more famous Battle of Thermopylae. We’ll not rehash those famous battles. We’ll instead seek a cameo snapshot of the people and their embattled civilizations of that time. For their contributions to what would become western civilization, we owe a great debt. In their failures, there may be great lessons yet to be fully realized. The year was -490, or “490 BC” in the way we reckon years today. It was a time of contentious – should we say global? – preparations for the defense of a divided and vulnerable western world against the generals of the mighty Persian king, Darius. “Global” meant known land masses within roughly a thousand miles of the Mediterranean, and perhaps included what little might have been known of a few lands even beyond that. In the world time frame around 500BC, early Greeks were not quite aware of it yet, but their civilization was about to confront a vast military struggle for the survival of a culture we today regard as “the western world”. They were only partially successful, because they always regarded conflict as having only a purely military solution. Another part of the world was also beginning a massive territorial reshaping of its own, a struggle that would come in several waves, like Europe’s, of over two thousand years’ duration. In each world, that struggle would tear lives of the common people apart, and put them back together in ways pleasing to the ebb and flow of the ruling powers. Previously we discussed natural disasters, setting the stage and scale for a glimpse at global man-made disaster. An obvious candidate is the hydrogen bomb. 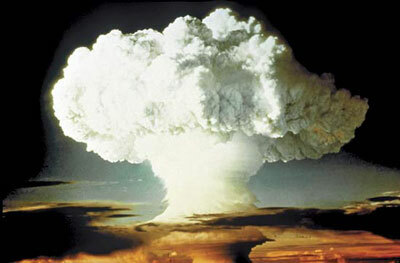 The photo above is from an early US nuclear test, which vaporized the island where the device was detonated. A more powerful 1961 Russian device produced a fireball 5 miles in diameter, and a mushroom cloud rising to a height of 40 miles. The Soviets had also planned but scrubbed a larger-scale test, but their own scientists warned that the plane dropping the test bomb could never escape the blast. Further, fallout would not be constrained to the test area or even Soviet borders. Cold-war testing the device had potential for starting a “hot war”. The larger device was built and stockpiled, but never detonated. The largest of these devices can kill directly and instantly beyond a radius of 100 miles – even with radar or satellite warning of a launch, there is no hope of escape. Rock underneath the blast area is turned to ash by the intense heat. Atomic weapons also kill, by fallout, many more victims outside the enormous blast areas..
Two more primitive and much weaker devices were used to incinerate enemy cities over 60 years ago, ending World War II. No one on the planet has ever used these devices in anger since. There is no popular support for use of weapons which, used in a full-scale exchange between opposing forces, will assuredly result in massive changes to the planet and the extinction of most of its life forms. At peak burst power, the 1961 Russian test released 1.4% as much energy as the Sun in that same instant of time. Paradoxically, the same principle by which bombs work as devices of destruction may someday be used to safely harness the fusion power of the sun to provide abundant heating, power and energy to all of mankind. The total energy released by the largest hydrogen bombs cannot match nature’s average volcanoes, let alone supervolcanoes. Fallout from the man-made device can cause also climate change through “nuclear winters”, but lethal radiation poisoning over vast areas make the nuclear device a man-made doomsday candidate for extinction-class catastrophes. One man-made event, represented by a device that could fit into a very sturdy farmer’s ox-cart, might still rival the Santorini event in long-term destructive power. It is easy to wish the devices had never been built, but the simple fact is that the physics became widely known prior to World War II. If the Nazi scientists had realized only a few kilograms of material are required, before the secret American war project, the outcome of history might have been dreadfully different. In the 20th century we developed giant warships (now obsolete) we called “Battle Ships”. Weighing about 45,000 tons, with a waterline length of about 860 feet and a speed of about 64 kilometers per hour, these were the most heavily armed ships ever put to sea. The “Iowa class” vessels carried nine 16-inch guns, firing projectiles weighing around a ton up to 20 miles. In World War II, battleships were found to be indefensibly vulnerable to attack by air. They were replaced, in a historical blink of the eye, by the aircraft carrier. USS Missouri. The Iowa class battleship was constructed to a length of 887 feet, with a draft of about 29 feet. Click the image to see a larger picture, with enough detail to show sailors standing on the deck, which gives a better idea of the scale of this vessel. The Missouri weighed about 45,000 tons and carried a massive complement of guns described more fully in Wikipedia. After retrofitting in 1984 she carried 1,851 men and officers. Click the image to see a larger picture. 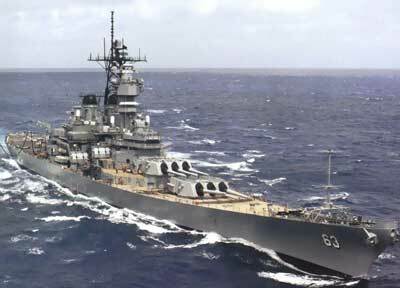 The USS Missouri served in World War II, the Korean War, the Gulf War and other hot spots throughout most of the 20th century. The historic signing of the Japanese Instrument of Surrender took place on board, signed by General Douglas MacArthur and Foreign Minister Mamoru Shigemitsu, with numerous Allied military officials in attendance, on September 2, 1945. The “Mighty Mo” was reactivated in 2984, outfitted with missiles and modern guidance systems to complement her 16-inch guns, and saw service the Gulf War, where she served essentially as a seagoing gunnery island to soften up Iraqi positions inland. She had also served in anti-piracy duty in the Persian Gulf, and must have been a massively imposing deterrent to Iranian-manned cigarette boats operating in the area. Compare the ship above to the ancient Greek war trireme, which was usually 120 feet or less in length with a draft (displacement) of about three feet of water. Below is a cast-iron cannon mounted on a wooden carriage, typical of about the 18th century. Small carriage cannon Image from Wikipedia Common. Here we see a cast iron cannon on what might be a horse-drawn carriage. What we don’t see is the mine that produced the iron ore, the foundry that smelted the iron and cast the blank for the cannon, or the factory that machined and finished the cannon and perhaps also cast the lead balls. We don’t see the industry that mined and refined the potassium nitrate, ground the sulfur and charcoal, and mixed the gunpowder. To actually build such weapons first required learning how to heat large quantities of metal to temperatures earlier cultures could not yet attain. Tools hard enough to cut and fashion the new metal had to be invented, shaping the parts to a precision for which the tools of measurement didn’t exist in earlier times … One could not simply master precision casting of a cast-iron or bronze barrel with a hollow bore. The bore had to be machined or polished to a sufficient smoothness to prevent the projectile from sticking and blowing up both cannon and cannoneer. The chain of productive innovation needed to set all this in motion would take the cooperation of a whole country or group of countries, and this would take centuries, not decades. Earlier city-states could rarely afford to develop such undertakings on their own. It is hard to grasp the full challenge of the required technology infrastructure at first. Ironically, countries that could best absorb the cost of large-scale military technology would be those that also excelled in the free trade of goods and services in peacetime. Conquistador-style looting, plunder and civilization-wrecking were essentially a static one-time transfer of wealth by force, and could carry the enormous overhead of industrialization only so far.